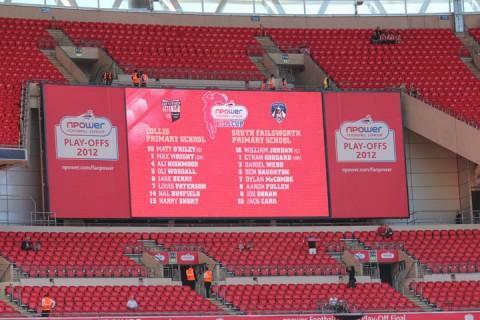 It was a dream come true just to be playing at Wembley Stadium but Collis Primary School (representing Brentford FC) exceeded even this by beating Oldham Athletic on Saturday to become the Npower League 1 Kids Cup winners of 2012! The weather couldn’t have been more glorious on the big day – illuminating the teams on the hallowed turf after progressing through local and regional finals to the famous ground – becoming the cream of the crop from 1,800 schools and 15,400 pupils that took part. 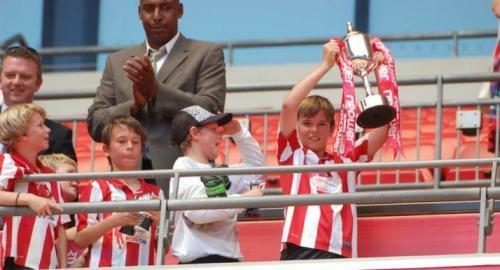 Parents, teachers, families and friends turned up to cheer on their teams and those who travelled from Teddington weren’t disappointed after Brentford went 1-0 up just before half-time with a goal from Hal Busfield. Goalkeeper Max Wright and defenders Oli Woodall and Jake Berry were composed and solid at the back and snubbed out all the opposition could throw at them. Ali Highmoor, Louis Paterson and captain Matt O’Riley worked tirelessly, as did Harry Short who would have doubled the lead had it not been for a wonderful save onto the bar by the Oldham Athletic ‘keeper. 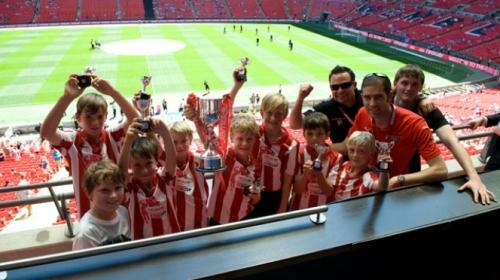 A flurry of close Brentford shots failed to change the score-line and the Collis year 6 players proudly lifted the cup after a presentation in the Royal Box. Both teams also were honoured to be flag bearers for the following nPower League 1 play-off final between Huddersfield Town and Sheffield United.